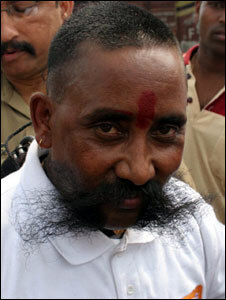 A man in eastern India says he is going to take to the air by hanging from a helicopter suspended by his ponytail. Earlier this week Shailendra Roy drew large crowds when he pulled the famous Darjeeling toy train with his ponytail. One end of an iron chain was tied to his foot-long ponytail, and the other to the train engine and three coaches, weighing some 35 tonnes. He says he keeps the hair strong by rubbing it with mustard oil and pulling cars and other heavy objects. "I am planning to dangle myself from a helicopter," Mr Roy said after pulling the train 10 metres the town of Siliguri where the track is flat. The Darjeeling toy train line is so called because of the small size of the trains and the narrow guage. It was built in the late 19th century and winds from the plains of West Bengal up the Himalayas to Darjeeling. It is a popular tourist attraction. Thousands of people turned up to witness Mr Roy pull the train on Monday. "It is a dream come true for me. I had planned to pull the train for at least 300 metres, but railway officials did not allow that," Mr Roy said. A railway official said they stopped him moving the train further for safety reasons. "He could have pulled the train further, but we did not allow him," said Subrata Nath of the heritage Darjeeling toy train company. Mr Roy said he had been planning to pull the train with his hair for more than a year. "I practised for this by pulling huge logs too," he said. This is not the first time Mr Roy has been in the limelight for his ponytail. He has pulled buses and trucks and uses small cars for practice. Last year, his ponytail tied to a rope, he flew from one building to another in front of television cameras. Mr Roy says he had trouble raising money to pay to hire the train. Railway official Subrata Nath said they charged him 3200 rupees ($80) to hire it for three hours against the normal charge of 26,000 rupees ($650). Mr Roy, who works as a driver for the police, was helped by donations from local businessmen.